They are obviously thinking big at Champs Hill Records. The label was only founded three years ago, and with the modest aim of recording some of the performances at the eponymous West Sussex chamber music venue. But now, as this new disc demonstrates, they are recording major orchestral works and adding leading orchestras and soloists to their roster. A risky policy? Possibly in financial terms, but there can be little doubt about the artistic merits of this new album. 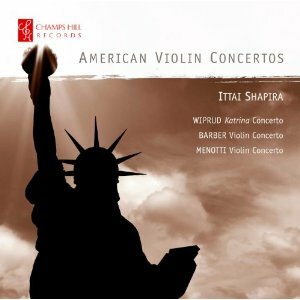 Three American violin concertos are presented, all performed and recorded to an impressively high standard, and programmed in such a way as to offer the ideal balance of consistency and variety. That’s not to say, though, that the three works are of equally high standard or interest. The programme begins with Menotti’s contribution to the genre, and, to be honest, I think Champs Hill are going to struggle to persuade British and European audiences that there is anything of interest in this work. Perhaps I’m just trying to excuse my own views, but the reception of Menotti’s music has always been much cooler on this side of the Atlantic. I’ve no objections to the Romanticism of this music, only to the patronising simplicity of its construction. Menotti bases each movement on a short motif, which he repeats ad nausem until it feels like time to stop. Anyway, he no doubt has his fans, who are unlikely to be disappointed by this performance, which is wonderfully controlled and precise, but also contains enough passion and commitment to give the work its due, and then some. Fortunately, the programme takes a turn for the better in the next work, Theodore Wiprud’s recent Violin Concerto “Katrina”. As I write this, the Eastern Seaboard of America is being pounded by Hurricane Sandy, so Wiprud’s concerto about the human cost of the 2005 hurricane in the Southern States seems all the more apposite. Wiprud plays a dangerous game, musically speaking, by imposing a narrative on the concerto, while also closely following the generic conventions of the form. He has the skill to pull it off, and does so by limiting the explicit references to his subject in the music. Wiprud writes in his liner note that the soloist becomes a different protagonist in each of the three movements: in the first a survivor of the disaster, in the second an observer and in the third a refugee. But as with all good programme music, you don’t need to know any of this to get the message as you listen. Wiprud’s two main musical ideas are graphic, often percussion-driven, depictions of severe weather, and abstract allusions to the Cajun music of the Deep South. Remarkably, this is the composer’s first ever concerto for any instrument, but his skill in balancing the competing demands of soloist, ensemble, programme and genre are impressive indeed. The orchestration is particularly impressive, and enables Wiprud to steer the storm music well clear of unintentional comedy. He also prevents the storm from overwhelming the entire work, which is essential for its ultimate message of hope and redemption, another aspect that is delicately handled. Ittai Shapira premiered this concerto, and he gives a fine performance of it here. The solo part is clearly difficult, but overt virtuosity would sit uneasily with the work’s subject, and so the performer’s technical skills are put instead to the service of the whole. The Liverpool Philharmonic is on fine form. The orchestra was recently heard on another recording of a recent American violin concerto, that of Jennifer Higdon, and, then as now, they show an impressive stylistic affinity for the music (although it should be said that their task is considerably aided by the impressive orchestration skills of both composers). Barber’s violin concerto sounds like a breath of fresh air after the tribulations of the hurricane. Given their close relationship, it is difficult not to imagine some kind of rivalry between Menotti and Barber when it came to their violin concertos. To Menotti’s credit, his later concerto is very different to Barber’s, but the Barber is clearly superior in every respect. For the Menotti and Barber, Shapira is joined by the Russian Philharmonic under Thomas Sanderling (who, for some reason, gets only a miniscule credit – it would be difficult to imagine his father being treated like this). I have to confess that I have never heard of the orchestra, but they put in a fine performance, especially given the alien musical world that this American music expects to inhabit. That said, a regular diet of Glazunov and Khachaturian would probably put you in good stead for performing this sort of music. The stylistic connections between all these 20th century Romantics were probably played down during the Cold War, but are becoming increasingly apparent now. The sound quality on the Russian Philharmonic recordings (engineered by a Russian team) is excellent, and is slightly superior to that afforded to the Liverpool Phil, not that I’ve any complaints about the sound quality there either. A fascinating disc all round, and one with something to suit all tastes. The ordering of the programme may look illogical on paper, but listening to the disc from end to end, it adds up to a satisfying and surprisingly coherent musical experience.